Chance McCoy ( Old Crow Medicine ) McCoy is a Grammy winning Indie Folk musician from West Virginia. After receiving a grant to study with old master musicians from the Appalachian Mountains, he went on to win the Fiddle, Banjo and Dulcimer championships in his home state. In 2012 Chance was living in a run-down cabin when a cold call from Old Crow Medicine Show landed him an invite to join the legendary Americana band of ‘Wagon Wheel’ fame. His first album with Old Crow, where he debuted his talents as song writer, singer and instrumentalist, earned the band a Grammy for best folk album. 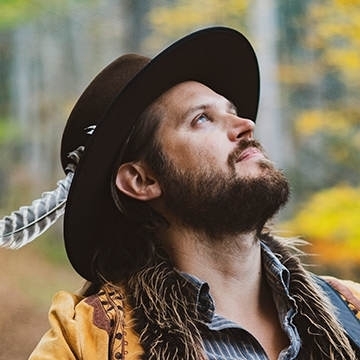 After touring with artists such as Mumford and Sons, The Lumineers, Willie Nelson, Sturgil Simpson, Margo Price and other luminaries, he turned his focus towards making his first solo record. His first LP ’Wander Wide’ set to be released in 2019. Straying far from clichéd Americana it’s an incredibly creative take on the modern singer song writer. Chance currently lives on his farm in the Appalachian Mountains of West Virginia where he enjoys a rustic back to the land lifestyle, creating music and producing films.